This book is packed with info and is meaty: lots of detail and info and good sketches of everything talked about. Kenneth Davids is huge in the coffee industry and has been a home roaster for years - since way before home roasting was mainstream (well, it's still not so mainstream...but you understand). He imparts tons of knowledge in this book and adds an interesting dimension to it all: the history of coffee roasting. But keep in mind, this book is centered around roasting, not so much coffee brewing and grinding and the like. 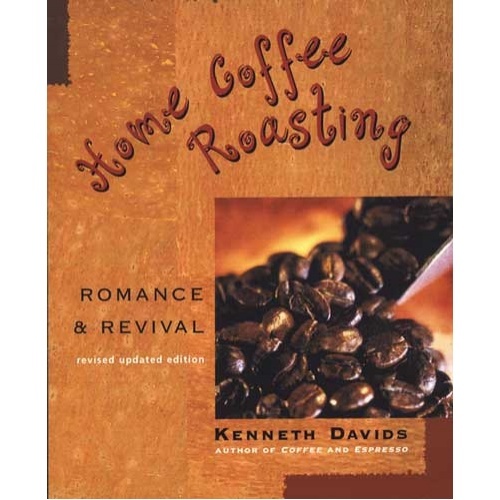 This book leaves you with a good knowledge of the history of coffee roasting, different roast styles, a good understanding of the nature of different beans from different regions and the tools available on the market for home roasting (although the Hearthware i-Roast has since become available and isn't covered). If you are interested in getting into home coffee roasting or are already a home roaster and just want to learn more, this is definitely the book for you. Below is the table of contents. Chapter 1: Why Home Roasting?